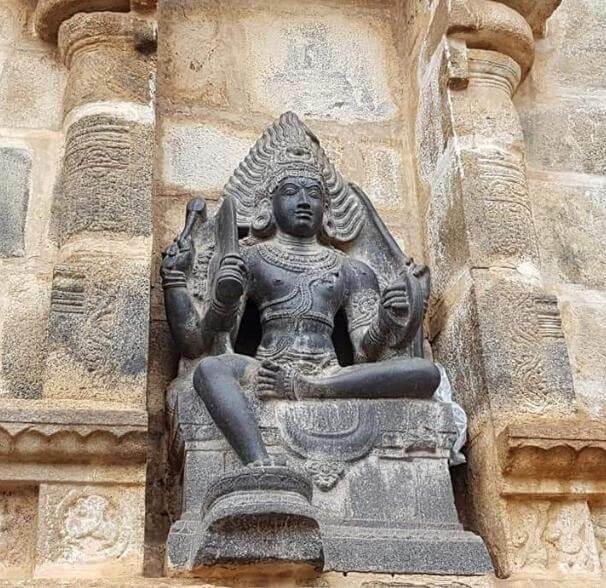 Airavatesvara Temple is a Hindu temple of Tamil architecture located in the town of Darasuram, near Kumbakonam in the South Indian state of Tamil Nadu. This temple, built by Rajaraja Chola II in the 12th century CE is a UNESCO World Heritage Site, along with the Brihadeeswara Temple at Thanjavur, the Gangaikondacholisvaram Temple at Gangaikonda Cholapuram that are referred to as the Great Living Chola Temples. 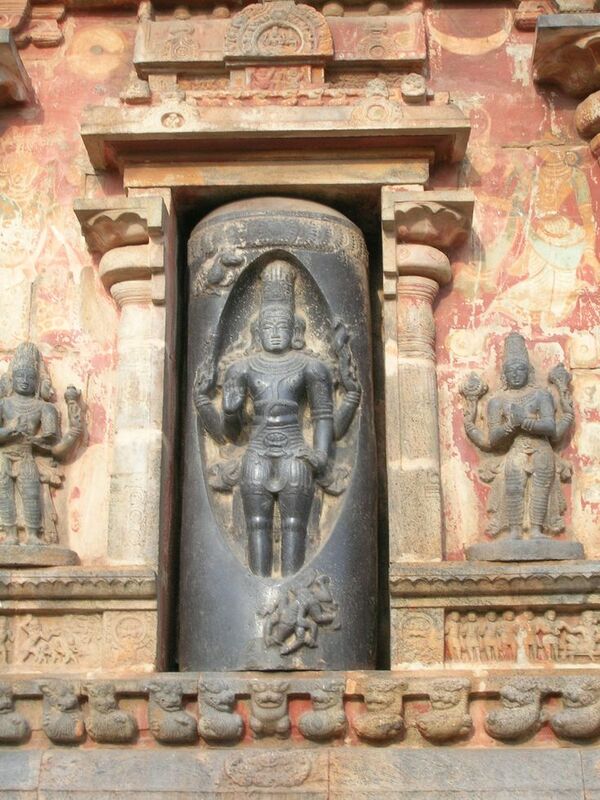 The Airavatesvarar temple is one among a cluster of eighteen medieval era large Hindu temples in the Kumbakonam area. The temple is dedicated to Shiva. It also reverentially displays Vaishnavism and Shaktism traditions of Hinduism, along with the legends associated with Nayanars – the Bhakti movement saints of Shaivism. The stone temple incorporates a chariot structure, and includes major Vedic and Puranic deities such as Indra, Agni, Varuna, Vayu, Brahma, Surya, Vishnu, Saptamtrikas, Durga, Saraswati, Sri devi (Lakshmi), Ganga, Yamuna, Subrahmanya, Ganesha, Kama, Rati and others. 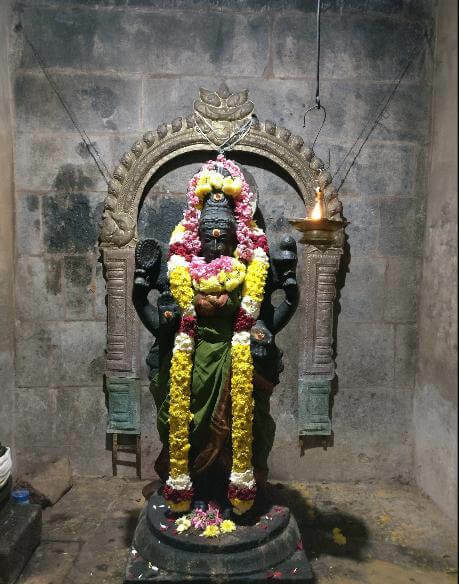 Shiva’s consort has a dedicated shrine called the Periya Nayaki Amman temple. This is a detached temple situated to the north of the Airavateshvarar temple. This might have been a part of the main temple when the outer courts were complete. At present, parts of the temple such as the gopuram is in ruins, and the main temple and associated shrines stand alone. The temple continues to attract large gatherings of Hindu pilgrims every year during Magha, while some of the images such as those of Durga and Shiva are part of special pujas. The Airavatesvara Temple is located in Darasuram, about 4 kilometres (2.5 mi) southwest of Kumbakonam, 310 kilometres (190 mi) southwest of Chennai and 90 kilometres (56 mi) from Chidambaram. 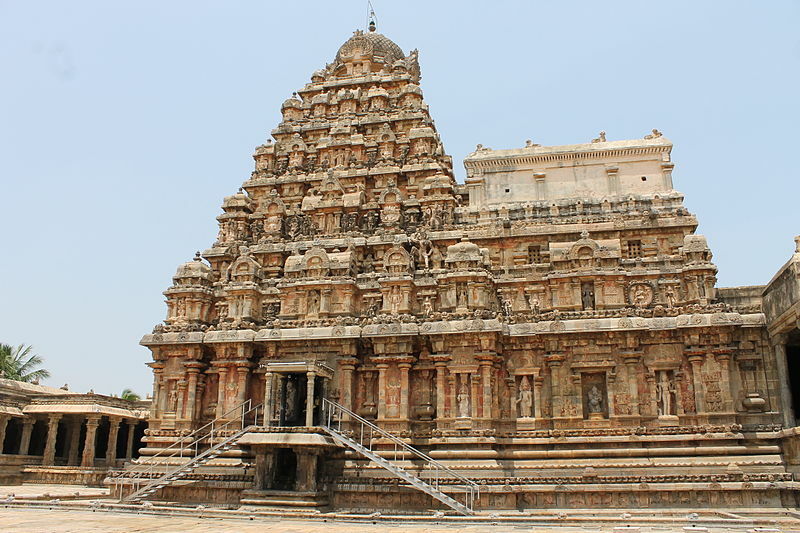 It is about 40 kilometres (25 mi) to the northeast to the Brihadeeswarar Temple in Thanjavur, and about 30 kilometres (19 mi) to the southwest of Gangaikonda Cholapuram Temple. All three are a part of the UNESCO world heritage site. The temple though inland, is near the Kollidam River, within the Cauveri River delta with access to the Bay of Bengal and through it to the Indian Ocean. 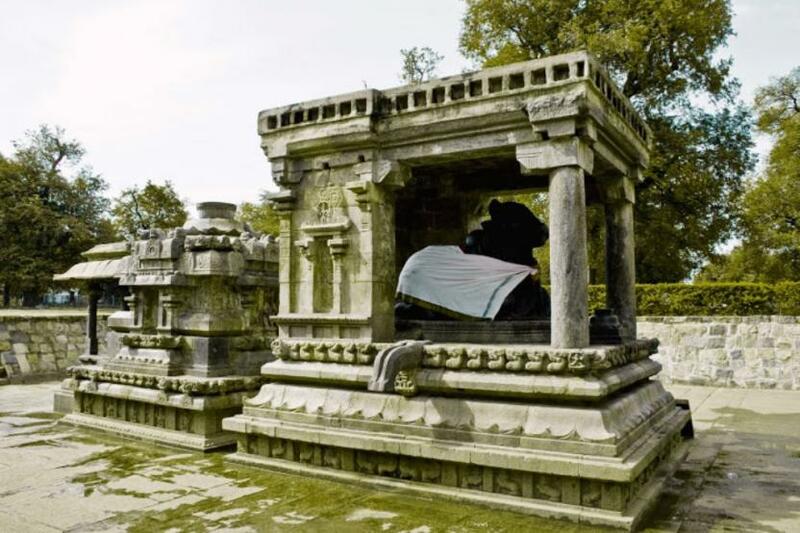 The Airavatesvara Shiva temple has a water tank. This tank has a connected channel that brings in Cauveri River water where Hindus gather annually to take a dip. The local mythology narrates how Airavata, or Indra’s (malla) white elephant was restored with clean, white skin after he took a dip in this tank. This legend is carved in stone in the inner shrine, and this Indra’s elephant gives this temple its name. 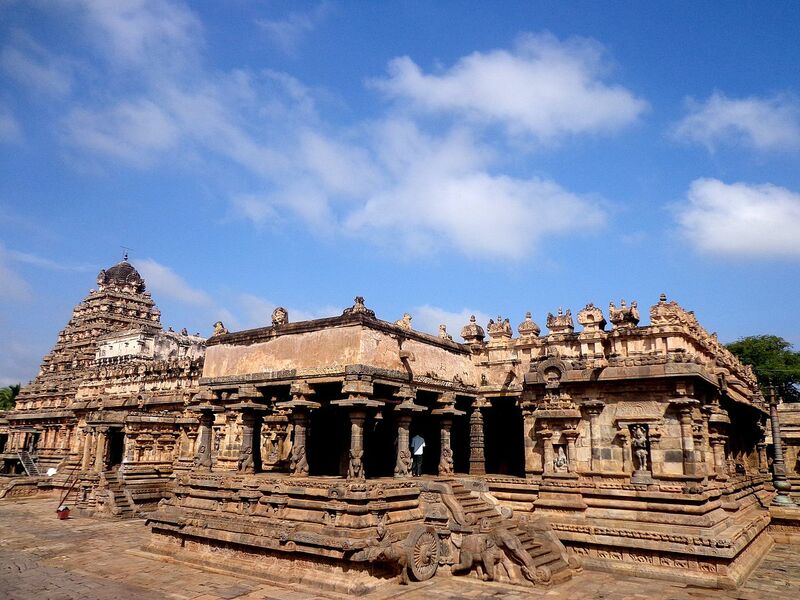 The Airavatesvara temple is another square plan structure completed in 1166 CE. The surviving inner courtyard is almost six stacked squares of 35 metres (115 ft) side, measuring a total of about 107 metres (351 ft) by 70 metres (230 ft). The Nandi mandapa and the stambha are found outside of this main temple courtyard and they are aligned with the main temple’s east-west axis. It is classified as Karakkoil, a temple fashioned after temple chariots which are taken in procession around the temple during festivals. The temple sanctum is a 12-metre-sided (39 ft) square, have thick walls on which the vimana superstructure rises to a height of 24 m (79 ft). The circumambulatory path is not provided immediately around the sanctum, as is found in the Thanjuvur big temple and the Gangaikonda Cholapuram temple. Rather, this path is outside in the courtyard.] 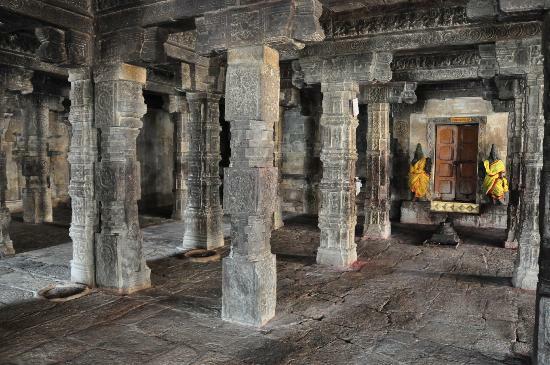 The sanctum garbha griya is connected to the mukha-mandapa through the ardha-mandapa supported on pillars and flanked by two massive dvarapalas. The maha-mandapa is a rectangle of about 24 metres (79 ft) by 18 metres (59 ft), with six rows of right pillars (forty-eight total). These have reliefs and intricate carvings. Towards the east of the maha-mandapa is the agra-mandapa also called the Rajagambhiran-tiru-mandapam after the king. This hall is shaped like a chariot, provided with stone horses and wheels. The design is similar to the Nritta-sabha (community dance hall) of the Chidambaram temple and the Konark Sun Temple near Puri, Odisha. The agra mandapa has an attached square porch of 7 metres (23 ft) side. It has ornately carved steps that go from east to west. On its east, outside the main podium, is the bali-pitham. It is unusual, in that it is produced as intricately carved balustraded steps. When one walks or steps on them, they produce a musical note. They are therefore called the “singing steps”. The temple was built by king Rajaraja II. He ruled the Chola Empire between 1146 and 1172 CE. The established capital for his predecessors was Gangapuri, also referred in some inscriptions as Gangaikonda Cholapuram, named after the holy north Indian Ganges River and goddess. Rajaraja II, however, spent most of his time in the secondary capital city of Ayirattali, also called Palaiyarai and Rajarajapuri. This urban complex included Darasuram, the site of Airavatesvara Temple.He was a patron of Tamil literature and sponsored new Hindu temples in the empire, instead of enhancements and expansions supported by his father and grandfather. The temple at Ayirattali, which came to be known as Airavatesvarar temple in inscriptions is one of his legacy. The reasons for this destruction are unclear. According to Vasanthi, the Pandyas who defeated the Cholas during the later part of 13th century “may have raged the city to ground” to avenge their previous defeats. 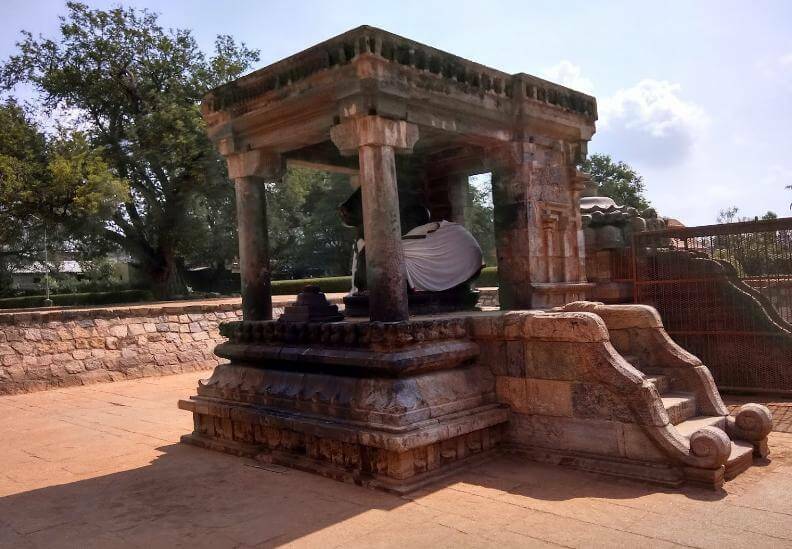 However, it is unclear why other temples were destroyed and this temple was spared, as well as why there are around 20 inscriptions from later Cholas, Pandyas and Vijayanagar Empire indicating various gifts and grants to this temple. An alternate theory links the destruction to the raids, plunder and wars, particularly with the invasion of the capital city and the territories that were earlier a part by the Chola Empire along with Madurai by the armies of Delhi Sultanate led by the Muslim commander Malik Kafur in 1311, followed by Khusrau Khan in 1314 and Muhammad bin Tughlaq in 1327. The period that followed saw wars between the Hindu kings and the Muslim Sultans who seceded the Delhi Sultanate and carved out new polity such as the nearby Madurai Sultanate (1335–1378). The Vijayanagara Empire defeated the Madurai Sultanate in 1378 and this temple along with other Chola era temples thereafter came under Hindu kings again who repaired and restored many of them.